The FA have charged Zlatan Ibrahimović and Tyrone Mings with violent conduct following the incidents that happened during Saturday’s match versus Bournemouth at Old Trafford. The spat started after Mings landed a boot to the head of the Swede, Zlatan retaliated by launching an elbow to the face. While Zlatan has been handed a 3 game-ban, the Cherries star could be banned for 6 games. Zlatan will miss the FA Cup clash against Chelsea as well as EPL games against Middlesbrough and West Bromwich Albion. 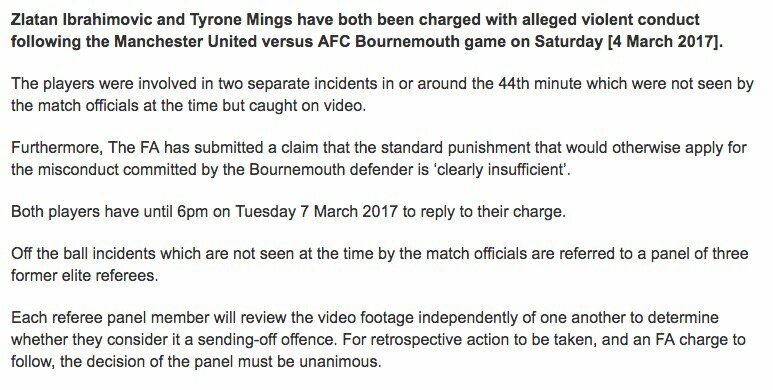 Both players have until 6pm tomorrow to appeal the charge. Arsenal lose first match against Liverpool. Fans go berserk, relaunch #WengerOut campaign.